Lateral release knee surgery is done to treat patella maltracking caused by tightness in the structures on the outer side of the kneecap. This tightness can pull the kneecap out of its normal resting place and cause it to sit at an angle, both of which can cause anterior knee pain and instability. 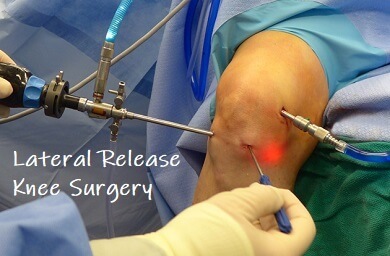 Lateral release surgery involves releasing the tight retinaculum on the outer side of the kneecap. This helps to realign the patella so it sits in the center of its groove, allows it to move smoothly, and alleviates pain and stiffness. Here we will look at what causes tightening in the lateral retinaculum, what happens during surgery, the lateral release recovery process, potential problems and the non-surgical alternatives. The kneecap rests in a groove on the front of the thigh bone (femur), known as the trochlear or patellar groove. As the knee bends and straightens, the patella glides smoothly up and down in the middle of the groove. The kneecap can slide, rotate and tilt in the groove as required. This is known as patella tracking and when the kneecap glides freely, the knee moves smoothly and weight is evenly distributed through the knee joint. On the outer side of the knee is a structure called the lateral retinaculum, a fibrous sheet of fascia that extends from one of the quadriceps muscles, vastus lateralis. Its job is to support the patella. Sometimes, the lateral retinaculum gets tight, pulling on the kneecap and changing its position. Tightness in the lateral retinaculum may develop due injury, particularly a patella dislocation, tightness in the structures on the outer side of the knee such as the iliotibial band, weakness in the quads on the inner side of the knee, weakness in core strength, ligament laxity and altered biomechanics of the lower limb such as increased femoral anteversion (where the hip turns inwards which affects the angle at the knee). 2) Lateral Riding Patella: this is when the entire patella shifts slightly towards the outer side of the knee, and thus doesn’t sit properly in the groove. This tightening in the retinaculum shifts the kneecap and prevents it from gliding smoothly in the patellar groove, which is known as patellar maltracking. Maltracking causing uneven stress, pressure and friction on the patellofemoral joint. This leads to cartilage irritation causing pain, stiffness and irritation at the front of the knee. In severe cases, the retinaculum may be so tight that it actually subluxes or even dislocates the kneecap completely, meaning it pops out of the groove completely. So what actually happens during surgery? Lateral release knee surgery is carried out arthroscopically, known more commonly as keyhole surgery, and is usually carried out under general anesthetic. Small incisions are made around the knee through which a camera and surgical tools are inserted into the joint. The tight structures of the lateral retinaculum are released by cutting through the connective tissue. The surgeon must be careful to release the retinaculum enough to allow for free movement, but not so much that the knee becomes unstable. The surgeon will test the movement of the knee to ensure there is good patella tracking and that the kneecap sits in the correct place in the patella groove. The wounds are the closed with sutures or staples, and the knee is dressed and a bandage applied. A pad may be placed on the outer side of the knee to keep the patella in a good position and prevent it from gliding outwards. You may be given a knee brace initially. Lateral release surgery is normally done as a day case, which means no overnight stay in hospital. You will be able to get up and fully weight bear (take as much weight as you are comfortable with) within a few hours, although some people prefer to use crutches for the first few days. You will be given an exercise programme to work on at home, and in most cases, people go home on the same day as their lateral release knee surgery. In the weeks that follow lateral release knee surgery you will work through a rehab programme with a physical therapist, focusing on regaining full range of motion at the knee and muscle strength. This is vital to ensure you make a full recovery and prevent further problems such as ongoing instability. You will be given exercises to help you regain full strength, flexibility and endurance at the knee. Recovery usually takes around three to six months. The focus of the first two weeks lateral release recovery is on controlling knee pain and swelling and getting you back on your feet. You will need to keep the wound clean and dry until it is fully healed. Ice can help to reduce pain and swelling so should be used regularly. Ice packs should be applied for approximately 10 minutes at a time, leaving a couple of hours between applications to get the maximum benefit – visit the ice treatment section for in-depth advice on how to use ice safely and effectively. You can usually stand up and start walking around almost immediately after lateral release knee surgery, but you may prefer to have crutches initially to take some of the weight off the knee – you should only need them for a day or two. A physical therapist will show you how to use crutches correctly, both for walking and for going up and down stairs. You will be given exercises to do following your lateral release and these are a vital part of lateral release recovery - it is really important you do these regularly. These will start gently and will focus on regaining movement at the knee and increasing the strength in the muscles. In most cases this starts with exercises you can do lying down or sitting in chair, typically closed chain exercises – where the foot stays in contact with the bed or floor so that you are not having to support the weight of the leg as you move the knee. As you get stronger, you will progress to more challenging exercises for the knee, hip and ankle, such as open chain exercises where the foot is unsupported, and standing exercises. Exercises that target the VMO muscle – vastus medialis oblique, are important too as the VMO helps to gently draw the patella medially, preventing it drifting back to the outer side of the knee visit the VMO exercises section to find out more. By around six weeks after your lateral release, there should be little or no pain in the knee and you can start cycling on a static bike to improve cardiovascular fitness and muscle endurance. You should be able to return to all your usual activities, including sports, somewhere between three and six months after lateral release knee surgery. As with any surgery, there are risks associated with lateral release knee surgery. The most common is ongoing knee pain. This is less of an issue nowadays as there is stricter criteria for surgery – in the past lateral release surgery was carried out with less careful patient selection so was at times inappropriate and therefore did not yield good results. 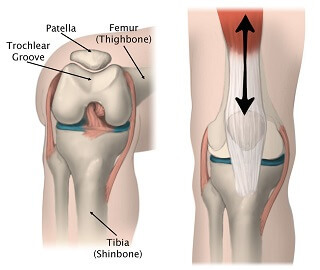 There are a number of things that can cause anterior knee pain such as runners knee or patellar tendonitis, but lateral release surgery is only appropriate if there is tightness in the patellar retinaculum causing patella maltracking. The best way to avoid ongoing pain following lateral release surgery is to comply with your physical therapy programme. Surgery is only one part of the process, you have to put in the work to regain the strength, flexibility and endurance of the muscles to get the best results. It can be tempting to give up too soon, but keep going until you have made a full recovery, which can take up to 6 months. Another possible side effects from lateral release surgery is bleeding into the knee joint which can cause pain and swelling, infection and scar tissue. Early mobilisation and using ice packs helps to reduce this risk. 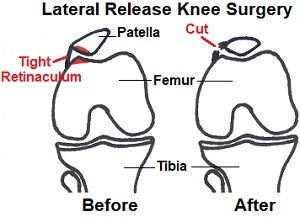 Medial patella subluxation (where the kneecap slips out of place) is also a risk with lateral release knee surgery. If there is overly aggressive release of the retinaculum and it goes from being too tight to too loose resulting in ongoing instability. Lateral release surgery should never be the first treatment for anterior knee pain. In most cases, tightness in the lateral retinaculum can be effectively treated with physical therapy and exercises to strengthen and stretch the structures around the knee. Some people notice benefits from doing exercises within a few days, for others it can take up to a month to notice the effects. People with a tight retinaculum will typically need to do exercises regularly (at least 1-2 times daily) for 3-6 months to allow the structures to stretch out and muscle strength to improve so that their symptoms fully settle. This can seem daunting, but it is worth it, so stick with it. Tightness in the muscles and structures on the outer side of the knee lead to a tight retinaculum, so stretches can really help. Whilst it is difficult to target the lateral retinaculum itself with a stretch, by stretching out the surrounding structures, this in turn has a stretching effect on the lateral retinaculum. Tightness in the iliotibial band (a band of fascia that runs down the outer side of the thigh and attaches to the lateral part of the knee joint) and the lateral quadriceps are commonly associated with a tight lateral retinaculum, so stretches targeting those muscles are a vital part of rehab – visit the ITB stretches and quads stretches sections to find out the most effective ways to stretch the muscles. Weakness in the muscles on the inner side of the knee can lead to reduced tension in the medial structures of the knee. As a result, they are unable to provide the medial pull to hold the kneecap centrally in its groove which can lead to the patella gliding laterally and patella maltracking. The muscles that particularly benefit from strengthening work in this situation are the VMO muscles (part of the medial portion of the quadriceps that particularly control the kneecap) and the glutes (weakness in the glutes can affect kneecap position). You can find strengthening exercises for both of these muscle groups in the VMO exercises and knee strengthening exercises section. A physical therapist can work on a rehab programme with you to strengthen and stretch the right muscles. They may also do some hands-on work using soft tissue mobilisation techniques such as deep tissue massage to help with stretching out the retinaculum, vastus lateralis muscle and ITB. This should always be combined with your home exercise programme to ensure long term benefit. In some cases, it can be beneficial to tape the kneecap so it is held in a good position allowing it to glide freely in the patellar groove. Taping also provides a sustained stretch on the lateral structures. Whilst taping can help with pain while in situ, it does not treat the underlying cause of the lateral shifting or tilting of the patella so it is important to combine taping with the other treatment methods to ensure long term results. Lateral release surgery should only be considered if symptoms have failed to settle after approximately six months of extensive effort of physical therapy and exercises. Remember, lateral release surgery is only appropriate if there is tightness in the retinaculum resulting in lateral patella tilting or gliding. There are a number of other causes of pain at the front and side of the knee which can be mistaken for retinacular tightness. If you suspect this may be the case, visit the front knee pain diagnosis or outer knee pain diagnosis section for help working out what is wrong with your knee.